Year in and year out, the fantasy football spectrum is shifted by the waiver wire. The saying, “You can’t win your league at the draft, but you sure can lose it” has never been more true than in 2018. From long holdouts to season-ending injuries, the waiver wire was your best friend if you contended for a fantasy championship this past season. These players range from long-time vets who were in the right place at the right time to undrafted rookies who took advantage in their of opportunity. No matter how they got there, many of these surprise studs determined who walked away victorious in your fantasy football league. From 2017 to 2018, Mitchell Trubisky improved his passing touchdowns from 7 to 24. His passing yardage also shot up from 2193 yards to 3223, while only having a 24% increase in passing attempts. Along with his increase in passing, Trubisky was also a fantasy factor rushing the ball, as he ran for over 400 yards and punched in three touchdowns. Matt Nagy was able to get the best out of his sophomore signal caller with his new scheme and new playmakers in Allen Robinson, Trey Burton, and Taylor Gabriel. As those three develop a stronger relationship, I see no reason why we won’t continue to see Trubisky as a QB1 option moving forward. Fellow Bronco rookie running back Royce Freeman, was looked at by many of the best minds in fantasy football as a sleeper to begin the season, but Phillip Lindsay quickly burst onto the scene and took the reigns of the Broncos’ backfield. The undrafted rookie finished the year as the RB13 with over 1,000 yards and nine touchdowns on the ground. With 35 receptions on 47 targets, Lindsay proved he can be a three-down back, as he racked up six games of 100+ combo yards If Lindsay can push Devontae Booker out of the receiving back role, the former University of Colorado star could be a top-20 pick in 2019. The former Pittsburgh Panther also busted out for a great season, quickly becoming a favorite target of Andy Dalton. Boyd finished as the WR18 in PPR formats, greatly exceeding expectations. 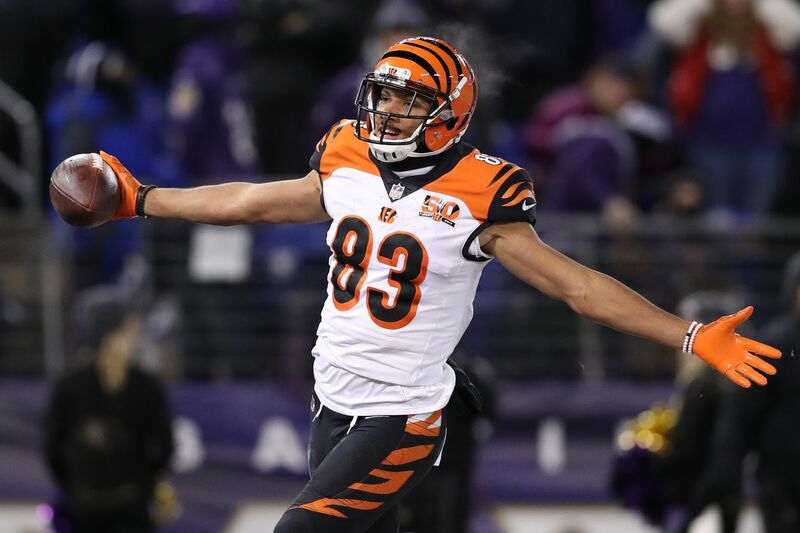 Hauling in 76 receptions for over 1,000 yards and seven touchdowns, Boyd was able to provide solid value for those who picked him up after his 21-point performance early in the season against the Baltimore Ravens. With Marvin Lewis out as Bengals head coach, Boyd could be a solid pick next year if the organization opts to go with an offensive guru as their next head coach. Humphries recorded double-digit points in PPR formats eight times after the Bucs’ bye week during week five, equating an average of 13.6 points from weeks 6-17. If he were to maintain that average throughout the entire 2018 season, he would’ve ended the season as the WR18. Do I expect Humphries to do that next year? Not at all, but he could provide great value as you look to add depth during the later rounds and certainly boosted some fantasy teams into the playoffs this season. Picking Kittle to the All Waiver Wire team wasn’t even a question. In a season in which CJ Uzomah and Mark Andrews were used as streamers, Kittle was a league winner for many. While only hauling in five touchdowns, Kittle finished the year with 1,377 yards (most among all TE) on 88 receptions with 136 targets. His catch percentage of 64.7% wasn’t fantastic by any means, but that that mark will increase as he builds a better connection with a franchise QB in Jimmy Garoppolo. As Kittle continues to grasp the offense and gets Jimmy G back under center next season, I don’t think it is absurd to consider Kittle as a top-15 pick in PPR formats next season.